I had my yearly eye exam yesterday. I LOVE my opthamologist. I've been going to him for a number of years, and I feel confident that my eyes are in good hands, so to speak. 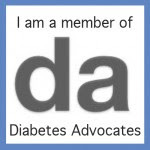 He's firm when I need to be doing more to take care of my diabetes, and supportive when things are going well. He was as pleased with my latest A1c as I am! I got some new frames, which is highly exciting. Can't wait to show them off! I decided that I needed some sweet frames for Friends For Life this summer, since I don't enjoy wearing contacts till three in the morning. Or turning around and putting said contacts back in at seven the same morning. No thank you. The best part of the appointment? These words: "Everything looks great. No sign of diabetic retinopathy." 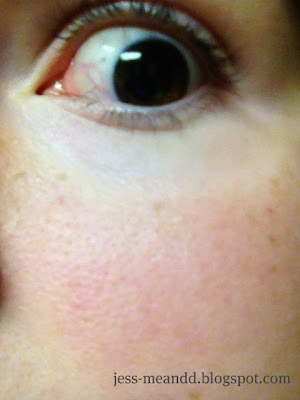 Oh, and here's an obligatory scary dilated-eye picture. Yes, I know it's hard to tell because my eyes are so dark, but they were dilated, I swear. Woo to the Hoo for a good report!! Woo to the Hoo is right! :) v. v. happy for you and your eyeballs. But seriously, it's great to hear that everything's great. While A1C sort of measures risk of complications, there's nothing quite as nice as someone looking into your eyes and telling you - definitively - there is NOTHING WRONG. You go girl!! I have never taken a shot of my dilated eyes before. Since my eyes are blue-grey that would be a cool pic. I'll have to do it the next time I go. Which should be soon. Unfortunately, I've had retinopathy for about 10 years now. But the sounds of "No progression at all" is pretty dang sweet.